Each week, our Oneg Room is filled with little people wearing big smiles. The room is adorned with furniture sized for them, a colorful rug and lots of arts and crafts. Joyful sounds reach our hallway. We call these special Sunday programs TBO Tots. Tots is perfect for families with children ages birth-to-three years old and includes members and nonmembers. Please download, print and send in the registration form to the left. If you are interested, or know someone who might be interested in Tots, feel free to come and check out the class or pass along this information. 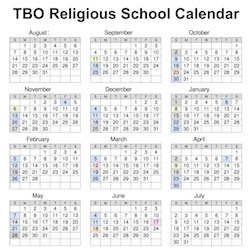 We meet every Sunday morning when our Religious School is in session, from 9:45am to 12:00pm.